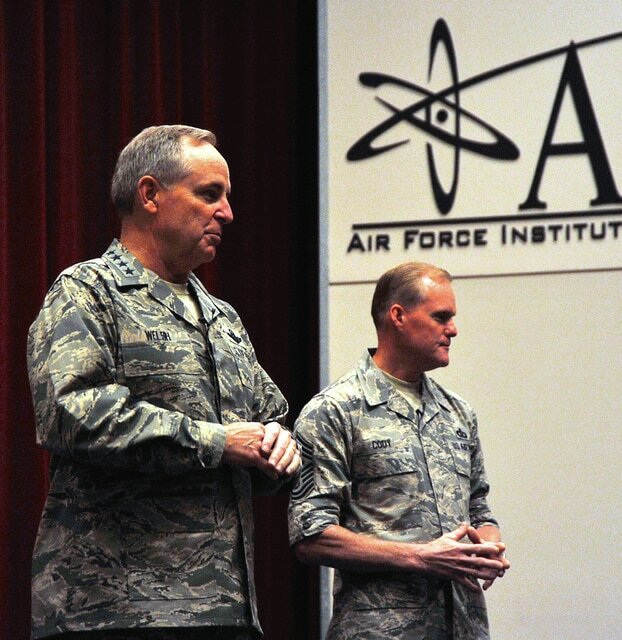 WRIGHT-PATTERSON AIR FORCE BASE — Gen. Mark A. Welsh III, Chief of Staff of the Air Force, and Chief Master Sgt. of the Air Force James Cody held an All-Call at the Air Force Institute of Technology here June 8, and spoke about the importance of the work being accomplished by the people in the room and across Air Force Materiel Command. During the All-Call, Welsh highlighted the change of command at AFMC, and he and Cody encouraged Airmen to think about how their work fits into the larger Air Force picture. But despite the challenges that the Air Force faces, there are things that will remain the same, said Welsh. During the event, Welsh discussed what the force needs to do to be successful. He began by explaining the importance of exercising common sense. Another way we can be successful is to improve our communication processes, Welsh said. He expressed a concern regarding how information is communicated and how incorrect information can spread easily and quickly through blogs and other social media—and subsequently through a poorly informed public. “We have to educate and train our Airmen on how to communicate properly, and how to get facts,” he said. Lastly, Welsh spoke about how an increased compassion for our fellow Airmen will also lead to our overall success as a service. A few months ago, leadership was considering the addition of a fourth core value—one that emphasized respect, Welsh explained. However, it was determined that elements of respect were already incorporated in each of the three core values thus it will not be added as a separate value. Welsh and Cody both commended Airmen for all of their hard work. “Thank you for who you are. Thanks for what you do. Thanks for making everything else this Air Force does possible,” said Welsh.